The Hoop Lore pics page is among my most popular on this blog. 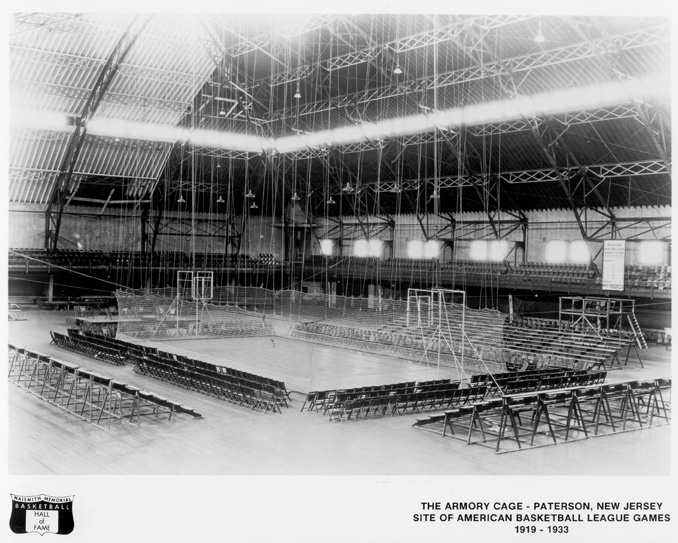 Given how many people who end up there have done a search on “caged basketball,” I thought I’d provide a little history about that early era of the game. Caged basketball is exactly what it sounds like: a basketball court enclosed in a cage. The example in the photo below shows a court surrounded by a 12-foot high wire mesh fence. The size and material varied depending on the location and teams. The apparatus was initially intended to speed up the game by making sure the ball was kept in play at all times. Without the fence, play was interrupted each time the ball rolled off the court, as the out-of-bounds rule had yet to be established. Once the ball was considered out of play, possession was granted to the first player who was able to get his hands on it, a situation that often resulted in a frantic free-for-all. The image of players pushing, shoving, and slapping each other didn’t exactlly coincide with anxious owners who were promoting basketball as the newest in family entertainment. Nearby patrons being drawn into the fray certainly didn’t help. Enter the cage. Theory had it the enclosure would also serve to protect players by preventing overzealous fans from intentionally interfering with game play—a logical assumption, though it proved premature. Sources of the day spoke of rowdy fans who stood at the fence and poked passing players and refs with hat pins and even lit cigars. And you thought today’s game was rough . . . I intended to create you that very small word to be able to give many thanks again just for the lovely techniques you’ve shown at this time. It has been quite incredibly open-handed with people like you to deliver unreservedly all most of us would’ve sold as an e book to end up making some money for their own end, specifically seeing that you could have tried it in the event you desired. Those pointers as well acted as the good way to comprehend someone else have the identical dream like my personal own to find out a whole lot more pertaining to this condition. I believe there are a lot more pleasant times up front for people who start reading your site.